Thank you so much for stopping by the Nancy Zieman Productions blog stop on the Free-Motion Framework book tour! Team Nancy Zieman met author/sewer/quilter Jen Eskridge, about 3 years ago, when Jen interviewed for an independent contractor position to work on the NZP blog and social media team. While working with Team Nancy Zieman, Jen found time to develop and author her own Free-Motion Framework quilting book, releasing now with C & T Publishing. Keeping with Nancy Zieman’s mission of sewing and quilting education, we knew we wanted to be included in this book tour. Find Jen on her own blog site, ReannaLily Designs, on Facebook, and on Instagram. “Free-Motion Framework is more than a quilting book. It is a guide to a journey of self-discovery and enrichment. 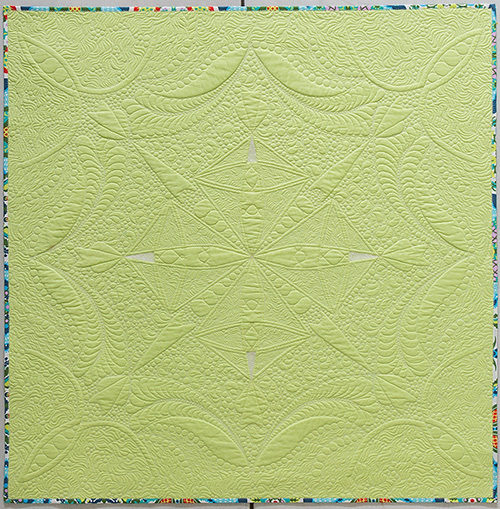 By using one of 10 linear designs as a framework, you can practice quilting motifs in small spaces while accidentally creating a 40″ wholecloth quilt,” says Jen. From here, prepare the fabric for quilting, as you would any other quilt. 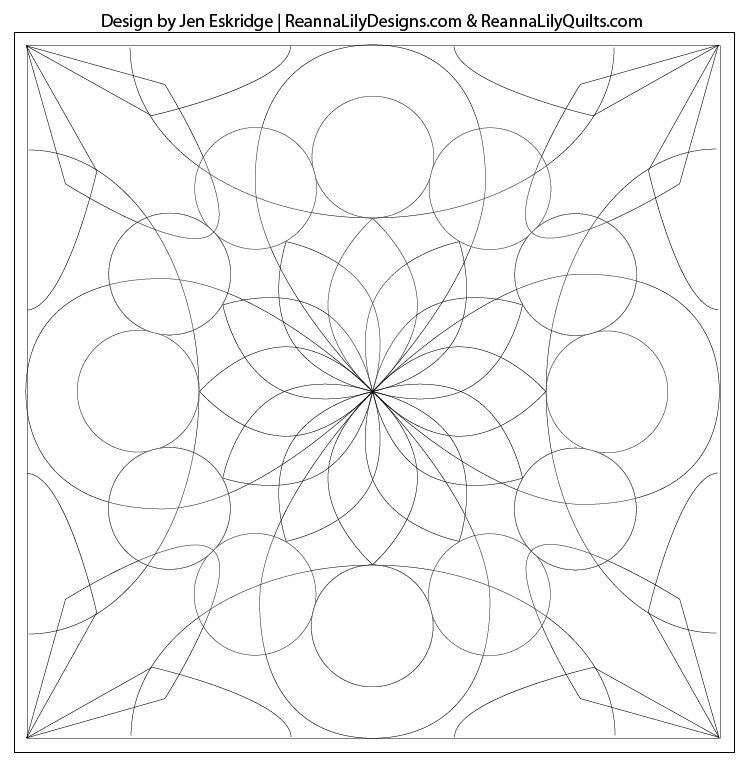 Choose shapes from the linear design to fill, symmetrically, with quilting designs. Practice as many design motifs as you like. Each time you create a small project it will help grow your machine quilting skills, and it will turn out completely different from the one you stitched before. Note: Build your skills on a domestic or longarm sewing machine. And, after you’ve practiced and quilted the entire piece, you’ll turn out an unexpected wholecloth quilt without the extensive planning of a wholecloth quilt design. 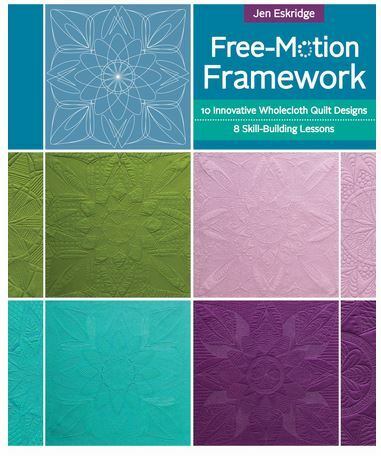 The Free-Motion Framework book includes ideas for basic quilting designs and concepts for how to challenge yourself. If you already enjoy stitching a meander/stipple design, consider adding in loops, stars, hearts, or leaves to push your design to the next level. 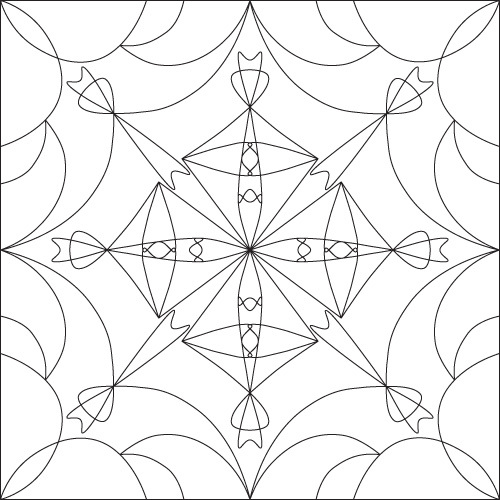 Goal Worksheets are offered for each of the 10 linear designs. Once you choose a design and mark your fabric, you may want to make notes as to how you’ll finish up the project. The Goal Worksheet will keep you on track and allow you to track your progress. Jen presents tips and variations for isolating shapes within the linear designs. Join the Free-Motion Framework Book Tour! See the interesting perspectives from Jen and the contributing quilters along this book tour. Be sure to check out each stop as each stop may have additional chances to win a copy of the Free-Motion Framework book. For a chance to win a copy of the New! Free-Motion Framework book, from C & T Publishing, please leave a comment sharing your favorite part of the quilting process. My favorite part of a quilt is the actually quilting. I want to improve my skills so I can feel more confident and free when I am quilting. I love the piecing part of quilting, but I want to learn free motion and ruler work, also. My favorite part of making a quilt is each step as I finish it. Although I am a raw beginner in quilting, my favorite part so far is the planning/design process. I have always admired the beauty and craftsmanship displayed in whole cloth quilts and aspire to make one. This book sounds like a perfect place to start. My favorite part of the quilting process is the excitement of starting a new project! Great book and wonderful designs. I need to work on the design planning and pathing. My favorite part is the piecing. 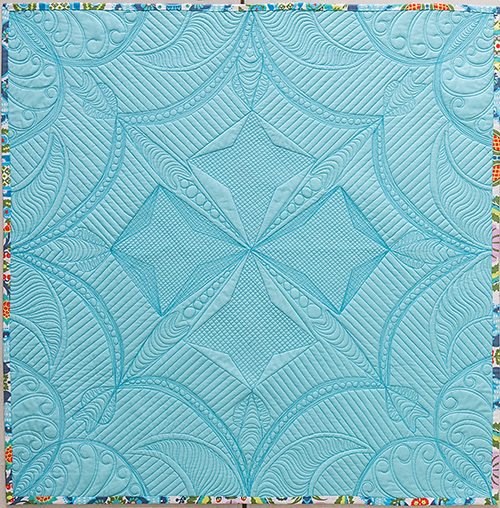 But, I have been practicing my free motion quilting and starting to really enjoy this part also. Such exciting ideas! Designing, sewing, pressing & now completing all the quilting myself makes the quilt even more special for the person receiving it as a gift! I would love to win this beautiful book. My favorite part is the piecing together of the quilt, thanks for the opportunity to win. I have to say, my favorite part is taking the quilt off the machine! It’s like setting it free, and I can wrap myself in the beauty, and not worry about all the little mistakes I’ve made. What a fantastic book! I would love to win a copy of this book, because my free motion quilting skills need some serious help. My favorite part of quilting is the piecing. This book sounds exciting, I’d love to try out the new designs. I am an experienced quilter but, I am just a beginner on machine free motion quilting and could use all the help I can receive. Thanks for the chance of receiving your new book. I love figuring out the design. I love stitching the pieces together because it’s amazing watching the design come to life. I like looking through all the fabrics as I select the fabric I’m going to use. However, it can be a bit daunting to decide which fabrics to use, they’re all so pretty! Love to free motion – really like to see how different each quilter can add their experience to the same pattern. I like putting all the individual pieces together. I love looking through fabrics, however, it can be overwhelming for me to imagine how it all needs to go together. I love how complete the instructions are to help me get this done. My fave part of the quilting process? Picking the fabrics and petting them in the process! I am amazed at what I see and seriously wonder “How does anyone come up with these ideas?” It is most humbling. I love constructing quilt tops but mystified when trying to decide how to quilt it. I love the idea of fmq but have never tried it. Maybe now is the time. Thanks for the information to get started. My favorite part is reading the book and getting ready to quilt! I like the idea of the Goal work sheet. Great idea to keep you on target. 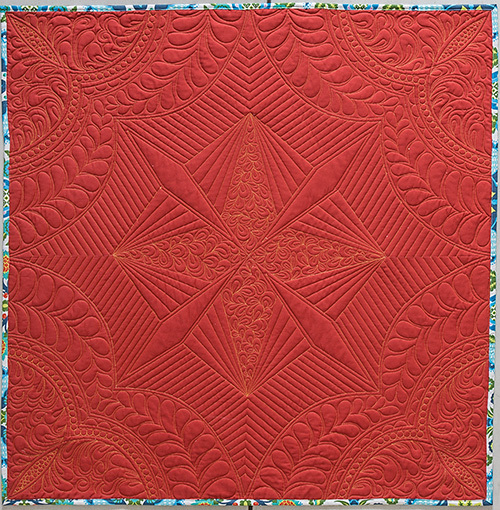 Love reading and seeing how people have different ways and tips of doing free motion quilting. Have done a tiny bit of free motion but would love to get into quilting free motion more. Would be grateful and love to win a copy of this book. My favorite part of fmq is getting that quilting finished! I really need to practice machine quilting on my home machine. This would be an excellent lesson to practice this. I love the piecing but as I get better with my FMQ I find I am enjoying that more every time! I’m just learning to fmq on my Simply16, and it is absolutely my favourite part of the whole process. Oddly enough the repetitiveness of the process. By the time I have done a design a few times its like a zen moment after that. I love the piecing. MY free motion skills need work. I am in the same way. I love piecing, but too much FMQ. My favorite is the quilting part. Im not really good with color and desgn as so many are. I havent hand finished snything as i dont think i know how. But im pretty ok with fmqing blocks. Need to do more with llarger sizes. Thanks for the chance. I enjoy piecing my quilt tops the most. Deciding how to quilt them is the hardest part for me. I love the designs in your book and would love to learn how to do them. Thank you for the giveaway. Someone will be very blessed to recieve the free copy. I am torn between the design process and the quilting. I am often stumped when it comes to figure out just “what to quilt”. This books looks like it would help with some of that process! Though I haven’t made many quilts (exactly 5) my MOST favorite part of the quilting process is seeing them on display or being used by our grandchildren (who received 3 of the 5)! Seeing the quilts and knowing that I made them–even with twp attempts at free-motion quilting–makes me so proud and grateful for the talents God has given me. I enjoy seeing the blocks go together and the design “grow”. When the binding is on and it is complete, I think stepping back and seeing the entire quilt is the best part. I have two quilts now waiting for the quilting process. I think that this new free motion book might be a great inspiration. Thank you for all the great materials on this site. My favorite part is the piecing. I love starting a new project and watch it all come together. I love the selection of color and pattern when deciding on a quilt. But what’s NOT to love in any part of the process! I enjoy the whole quilting journey-from idea through selection of fabrics to execution. But I must admit that putting those quilting stitches in (either by hand or machine) is so satisfying because they signal another nearly done project for someone I love- or for me. I love everything about sewing. My husband surprised me with a mid size long arm machine and I am learning to free motion and how to use rulers. I am having fun practicing. These designs are so beautiful. Just itching to stitch them out! Love learning new skills and creating something uniquely me. Love the satisfaction of creating sometime with new skills. The ironing of fabrics! It means I’ve chosen a project, purpose, fabrics, time and am READY! Ironing clothes? BITE YOUR TONGUE, how dare you even think of it! My favorite parts are the planning, picking the pattern and material. I also like the sewing of the pieces to make the blocks. I like to do free motion quilting using words or pictures that personalize the quilt along with traditional quilting designs. I quilt on my 440QE Bernina. I try different things to add interest to the quilt and also to keep myself from feeling it is becoming tedious. Jump in and have fun quilting! I enjoy the whole process of making a quilt, but I really have fun with the free motion quilting. Patchwork is my favorite part of quilting but I also love free motion quilting. I love the creativity of the whole process. Even when following a pattern, the fabric selections and quilting design are all my own. My favorite part of quilting is free motion quilting with mt stationary machine. I am just learning machine quilting. I like the detailed designs that can be achieved! I enjoy the entire process. Planning, cutting, sewing, and quilting. I love a challenge. I especially enjoy the show and tell. 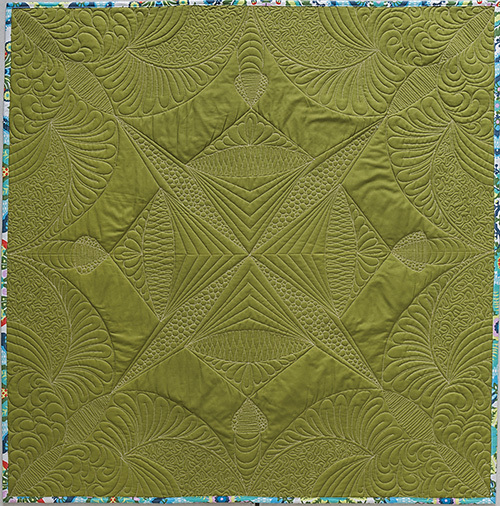 I am learning to free-motion quilt and the designs out there are just incredible. Picking the quilting design is difficult–what if I pick the wrong one? !–but the process of free-motion quilting is so much fun–but I still need a lot of practice! My favorite part of quilting is planning the quilt, what pattern to use and picking the fabric. I struggle the most with free-motion quilting and would love this book. I’m sure it would help the process. The binding is my favorite part, because that means the quilt is finished and ready to enjoy. I love when it is finished! I love making tops – quilting them and picking the designs has always been difficult! This book looks awesome – those examples are fantastic! I like the whole process. I’m learning to free-motion quilt, this book would come in very handy at the moment. I enjoy the entire process but my favorite part, my downfall, is planning and shopping. My latest endeavor is creating small wall quilts from children’s drawings. The imaginative things children draw are endless and the quilts are fun and expressive. The kids get so excited when they see their artwork in a quilt. My fave part is putting all the pieces together and watching what comes out as I go. Even using the same pattern again and again…with different fabrics…it’s ALWAYS different. I love every part of quilting. My last quilt was done with straight lines and I chose to quilt them 1/2 inch apart. It really is amazing how the quilting gives a quilt a whole new cozy look. Now it is time to learn FMQ designs. I love finishing the binding and seeing all the parts become whole. My favorite part of the quilting process is that magical moment when I take the quilt off the longarm and see that all of my sweating and fretting actually produced something beautiful. I am a newbie longarmer who would love to one day be a professional, so I could really use your book! My favorite part is the quilting. Quilting is like the icing on the cake. It enhances the what has already been pieced or done previously. I have never done a whole cloth and look forward to trying that someday. Wonderful ideas!!! I just love the creativity in the entire process. I love it all. The front is the fun and the easiest, but I love making unique backs and then the quilting adds so much character to the whole piece. Once I embraced the idea that perfection is just a goal and stopped comparing my quilts to others, I love the challenge and fun of free motion quilting. My favorite part of the quilting process is knowing that the quilt I made is truly my creation, even the quilting. While I am very new at free motion it is important to me to complete even that part myself. I love the process of quilting and seeing how the quilting comes alive and highlights different parts in the piecing, or builds on itself, in the case of whole-cloth quilting. For me, quilting is the reward after completing the careful work of of piecing it well. Thank you for chance to win this new book! Love designs. I just got a new mid arm and this is awakening my creativity. Such wonderful designs. I love learning new skills and perfecting my old ones so I am sure I would like this book. Hand binding at the very end is my favorite part of the quilt process. I like this because it gives me that “done” satisfied feeling at the end of the long process of quilting. Also, during the hand sewing of the binding, I get to spend some cozy time with the quilt in my lap which is especially nice when it is a gift for someone else and I won’t be seeing it much in the future! My favorite part of free-motion quilting is when I’ve hit the “zen” moment – my hands moving the piece in time with the machine. It’s the worst possible spot to run out of bobbin! My favorite part is piecing. I’ve tried the free motion quilting, but haven’t had much luck…but I’ll keep trying! Planning. Choosing a design, the fabrics, colors and deciding how I want to quilt the final product. I would love to know more about free motion quilting as my friend recently bought a second hand machine. My favorite part of the quilting process is the planning and piecing. Looks like great ideas in the book. I keep looking at all the patterns and have sewn a couple of squares – getting enough nerve to do an actual quilt. I think I need to get this booki!!! My favorite part of the quilting process is giving the finished product to a someone. When you sleep under a quilt, you are wrapped in love. My favorite part in the quilting process is cutting the fabrics in preparation of piecing the quilt. Watching the pieces stack up into their neat units is exciting for me. My favorite part is sewing the top together. Have been a quilter for years, just now dipping my toes into quilting my own …scary!!!! Would love to try the techniques in the book! Great ideas to make the quilt extra beautiful!!! Can’t wait to try some of them. Have pieced 2 large quilt and ready to quilt. Now what? Struck with fear of how to go about machine quilting! I’ve sewed for years, but do not feel I have the artistic ability to do freehand quilting. The best part is when the quilt is done and all the sections are now one. My favorite part of quilting is looking at the work I have done. It shows I have have accomplished something. Thanks for the chance to win. I feel that after doing all of the piecing of a quilt I want the whole finished quilt to be my work. This book appears to teach beautiful detailed stitching to enable that end result. It’s a must have for the quilters library! Free motion quilting is so hard to perfect. I would like to try this method of hers because it looks like it would be more exact with the guides or rulers. To be honest about the best part of quilting for me, is when it is finished and I can be proud of the good work I’ve done. Thanks for the chance to win this book. This method, I think would do that for me. Wow! This sounds like a guide to wonder and potential. I’d like to be able to use my new longarm effectively but to this point haven’t gained the skill to do so. What an exciting guide to REALLY quilting well. My favorite part is deciding on the quilt designs I’m going to use on the quilt top I’ve made. I’ll admit, I’m very new at quilting, so I’m confident the “New Free-Motion Framework” Book would help me a lot. Thank you so much for the opportunity to have a chance to win this book! Of all of the quilting process my favorite process is the sewing of the rows together into a pieced quilt top.This may seem like a very minor part, but to me, it is the turning point of the quilt. At this point I have completed the piecing and am now ready to move on to the actual quilting process. Additionally, it is the first first peek of what the completed process is going to look like. Although I have seen the beautiful fabrics and the completed blocks, this part is the “a-ha” movement when you realize that you are creating something beautiful! I really like the time I spend with my friend picking out colors and designs, then seeing how it looks in the end after she is done with the quilting. I enjoy the planning and cutting more than the sewing. I like least the pressing, but a well pressed Quilt is rewarding. What a great book. I have always been amazed at how quilters came up with all these designs and would love to learn how to do them. One step at a time I guess. I love choosing the pattern and fabrics. So many options for my unique creation. What a great book! I love the whole process of choosing the fabric & colors when gathering fabrics & thread to begin! My favorite part of quilting is when I can finish the top and get into quilting the sandwich. Love the look of these designs, would love to learn how to quilt like that. Thanks for the inspiration. My favorite part of the quilting process is designing the quilt and then seeing it come to life. I enjoy the planning process, but deciding which plan should go with a particular fabrics is harder. Usually the quilt top gives me the quilting plan, but my FMQ skills don’t always get the message! I love the designing phase of quilting from picking fabrics to sewing on binding. I try to practice machine quilting every day. I need all the help I can get. My friend and I purchased a sit down quilting machine. As I quilt I think of the loved one who will receive the quilt, and that helps me make it unique even with standard techniques. There is nothing like the joy of sharing stitches with loved ones, or babies in need, or families who are frightened and feel unloved. Stitching quilts make so many things possible. Wow,what a great tool! I have tried to get the hang of free motion for several years now. This will be such a roadmap to follow. Can’t wait to give this a try, I have the dream big panels bit too afraid to start on them yet and this is exactly what I need. My favorite part of the quilting process is creating the blocks and putting them together. I really would love to enhance my quilting process. This book looks great! Thanks. For me, deciding on quilt designs is the hardest. But, once I decide, I definitely enjoy free motion quilting to see the quilt come alive. My favorite part of the quilting process is putting the top together. The hardest part is deciding how to quilt it so I’m sure I could get some ideas from this book. Looks like a good one! My favorite part of quilting is seeing the quilt top come together after all the dreaming and planning. I would love to learn to quilt designs as beautiful as those on the cover of the book. Sounds like it might be the perfect book for a newbie like me! My favorite part of quilting is sewing my blocks together to make the quilt top.